It's my turn to host this week and as today happens to be my Wedding Anniversary (14 long years! Lol), the theme I chose is a 'no-brainer'. I'd like to see some Wedding Anniversary creations. For once I was ahead of the game and had already prepared a card for my DH, so my offering today will be given to my parents who will be celebrating their own special day next week. 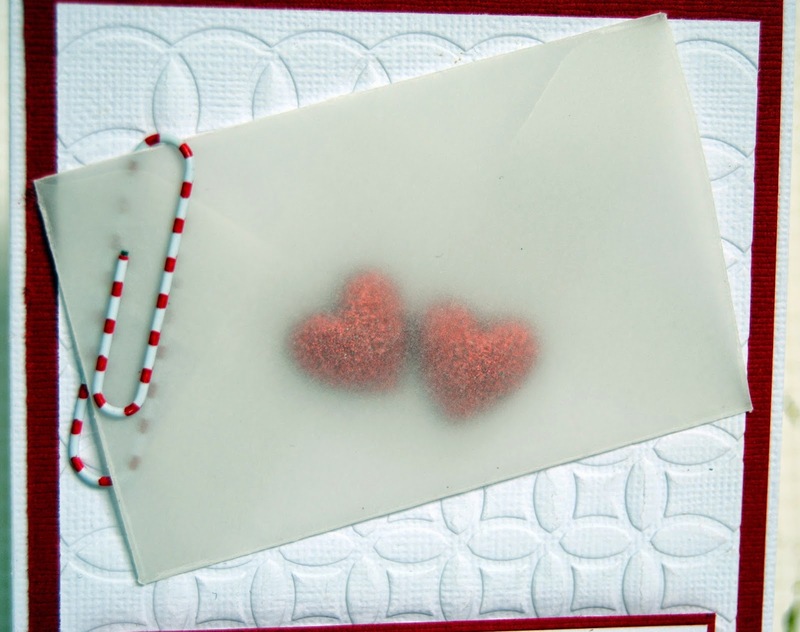 The little vellum envelope I made proved to be a little tricky to photograph, in order to get a clear shot of the two glittered enamel hearts inside. Feel free to join along with our challenge this week.....just link up over on the blog and don't forget to check out what the rest of the Girlfriends have been up to. I'll be back again on Friday as it's Sketch Challenge time over at Scrapmuch? Gorgeous card, Jayne! I love the colours you chose and the embossing and envelope are perfect! So sweet! I love the design. Beautiful card Jayne. Wishing you a very Happy Anniversary. This is a beautiful card! Love the little hearts in vellum. Happy Anniversary!